This article was created in partnership with TemplateMonster. Thank you for supporting the partners who make SitePoint possible. Most users feel overwhelmed when they need to select the best ready-made design for their website. 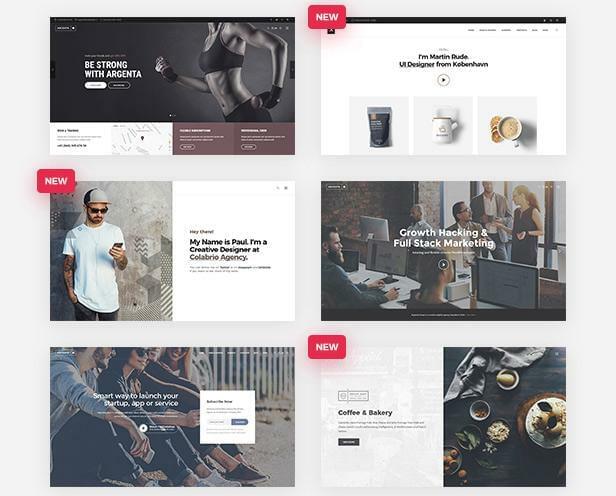 There are plenty of agencies and web design studios offering unique designs to help users get started with websites for multiple purposes. TemplateMonster and ThemeForest have proven to be the two leading digital marketplaces selling WordPress templates of top quality. Comparing these two options, which one is a better place to buy themes for your websites? That’s the question that we are going to answer in this post. WordPress has become one of the leading content management systems in the world. With its help, you will find no difficulty launching any kind of website, representing any business niche in an effective style. Selecting the most optimal starting point for your site, you need to make sure that your WordPress theme complements the content that you are going to share on your site. Using WordPress, you can create stunning blogs, portfolios, business and corporate web projects, landing pages, and even eCommerce sites. Depending on the goal and the type of the online project that you need to launch, you need to select WordPress themes that meet your specific requirements. For example, launching a blog, you need to select a template that improves the readability of your content. If you want to launch a portfolio site, then the template of your choice should be optimized for handling image-rich web projects perfectly well. Many WordPress templates available today are pre-installed with plugins and extensions intended to enhance the performance of niche-specific web projects. Just in case the selected WordPress theme isn’t loaded with the necessary tools, make sure that it’s compatible with the respective functionality. Security is one of the top priorities that you need to take into consideration while selecting the best WordPress theme for your site. Although WordPress is known as one of the safest CMSs on the web, featuring regular updates, you need to make sure that you download a template that features regular updates so it won’t become outdated a few months after the launch of your site. EasyJet is a functional multipurpose template sold by ZEMEZ in the TemplateMonster digital marketplace. This is a usable ready-made solution that is easy-to-handle by both beginners and expert webmasters. 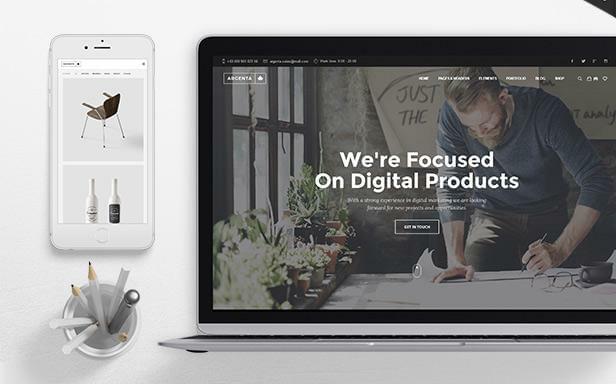 This is a feature-rich WordPress template that comes loaded with everything that you need for the launch of personal, business or eCommerce sites. There is no need to be an expert web designer or a programming specialist in order to handle the theme on your own. The theme’s download pack includes a wide range of features that will appeal to users of all skill levels. Argenta is a creative multipurpose WordPress template sold by Colabrio on the ThemeForest marketplace. This is one of those feature-rich WordPress templates suited to be used for content-heavy web projects. Collections of the fully editable layouts that are included in the theme’s download pack are ready to be customized by means of the usable modification features that can be accessed via the dashboard. Both of the reviewed WordPress templates are multipurpose solutions that include a handful of tools and features that provide for specific needs. Both templates include similar options and different sets of tools, which make one of them stronger than the other. Well, enough said. Let’s get straight to the comparison. In order to start working with any WordPress template, you need to have WordPress installed. If you haven’t done this yet, make sure you install the latest WordPress version on your web host. In order to start working with the EasyJet WordPress template, you need to make all the necessary preparations and run the plugin installations. This guarantees that the chosen template will work correctly after the installation of all its components. EasyJet features the automatic and manual installation of all components. One-click installation is realized with the help of the Cherry Wizard plugin. As soon as the theme is installed, you will receive a notification window asking you to select the skin for your future site. It’s generally considered that automatic installation will be the best choice for non-tech-savvy users, as well as those webmasters that look forward to using all the tools included in the theme’s pack. EasyJet can also be installed manually. To use this method, you need to have access to your WordPress server via FTP or the File Manager of your hosting control panel. 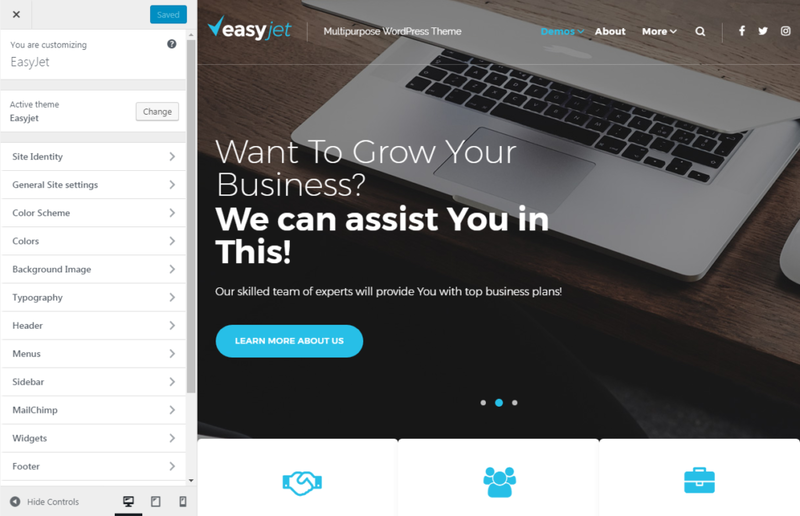 While installing EasyJet manually, you can select the plugins, tools, and extensions that are essential for your future site, and skip those solutions that won’t affect the usability of your online project. As for Argenta, the theme features regular installation, which will upload all components of the theme’s archive to the web server. The availability of additional skins is one of the biggest advantages of both of the mentioned WordPress themes. Both templates feature growing collections of child skins, which are expanded with the release of every consecutive update. EasyJet includes a collection of 12+ outstanding homepage demos that are intended to be used for a range of niche-specific web projects. You can preview all demos on the theme’s live demo site. If you have already bought EasyJet, then you may expect new skins to be delivered to you automatically each time a new update is released. Switching between demos you may rest assured that all of your data will remain untouched. The demo skins include CrossFit studio, beauty, business, construction, architecture, photography, restaurant, car repair, and other niche-specific skins. Argenta gives users access to 14+ demo skins, all of which can be installed with just one click. Similar to EasyJet, new skins will be delivered with the release of new updates. The skin demos are available for free online preview, so you can see how different skins work and feel before making your final decision. The demo skins include personal blog, cafe and bar, fashion store, corporate portal, mobile app, sports and fitness, etc. EasyJet includes collections of pre-made layouts in every demo skin from the gallery. This guarantees that the pre-designed layouts will fit your niche-specific web project, making it so much easier to bring the necessary changes to the page in the future. For example, selecting a skin for a business blog, you will be provided with the possibility of choosing from several blog layouts. Portfolio templates include sets of portfolio layouts, and so on. The Argenta template is loaded with a range of pre-designed layouts, ready-to-go pages, and six headers that are ready to be adjusted in any way that matches your personal or business needs. EasyJet is loaded with the WordPress Live Customizer and Elementor page builder, which provide for the code-free modification of pre-designed layouts. WordPress Live Customizer is one of the most popular WYSIWYG solutions that allows you to change general site settings, colors, typography, social icons, page layout, menus, sidebars, widgets, etc. Moreover, EasyJet is loaded with one of the most functional frontend drag-and-drop page builders – Elementor. It helps you to create unique content without any specific coding skills. The builder is loaded with a large number of elements that provide for the quick and seamless customization of the theme’s design. Additionally, you will be provided with a variety of content modules, which make it quicker and effortless to enhance your site’s pages with videos, buttons, dividers, carousels, image galleries, sliders, etc. Argenta includes WordPress Visual Composer. This is one of the most popular WordPress extensions included in the theme’s package for free. With its help, you can make any sort of changes to the theme’s layout code-free. The layout structure, header and footer can be personalized as you simply drag and drop different page elements. The JetElements addon. This is an outstanding module, which was developed to enhance your experience of working with Elementor page builder. The module includes a rich collection of features intended to make your website unique and engaging. These include an advanced carousel, map, animated texts and boxes, banners, brands, and a number of additional elements that are intended to help you deliver all pieces of data quickly and easily. EasyJet contains Cherry Data Importer. This is a plugin that will help you export posts, comments, widgets, settings etc., from one site to another. With a single click of a button, the plugin generates an XML file that can be imported to another website. As mentioned at the beginning, the Cherry Wizard plugin is included as well. With its help, you will need just a couple of minutes to get all of the theme’s components installed on your site. Thanks to the Contact Form 7 plugin, you can manage multiple contact forms. It also lets you customize the form and the mail contents flexibly with simple markup. Argenta includes three premium WordPress plugins under the hood. Visual Composer is provided for the code-free modification of the template’s ready-made layouts without the need to change a line of code. Thanks to the built-in Revolution Slider, you will be able to create fully responsive slides featuring usable transition effects. ACF Pro is the advanced custom fields plugin for web developers. With its help, you can bring changes to all sections of your site, thus taking full control of your WordPress edit screens and custom field data. Both of the templates are ready to be customized to meet your demands, using the functionality that’s included in their download packages. EasyJet is sold for $75. The single site license provides you with the non-exclusive permission to use the template on a single site. The cost includes all premium extensions that were mentioned in the review. It also includes free 24/7 technical support, detailed documentation, and free lifetime updates. Additionally, you can order installation and optimization of the theme for a fee. Customization and installation services are not provided. If you asked me which of these two multipurpose WordPress themes I would like to choose for the launch of my own web project, my answer will be EasyJet for a number of reasons. First of all, it’s likely that I will need some help with installation and customization as I start working with it. While the tools and theme options are rather intuitive, I’d like to feel confident that I won’t be left alone. The availability of extra modules, widgets and premium plugins saves me extra cash and time while uploading the theme with my content and changing the layout. The wide choice of skins and diversity of pre-designed layouts attracts me as well. Launching a customized website in a matter of days becomes possible with the frontend Elementor page builder. Additionally, I can feel safe that all data will be protected and up-to-date thanks to the regular updates. Alla will gladly help you with updating unique content for your website and establishing a mutually beneficial, long-term partnership.